Journalism moves from one story to the next. Statistics matter for the sake of headlines. Dates serve as a good reference, for the next story. April 3 was the day's top story when Asif Ali Zardari went to Nine Zero, the first time in twenty years, we were told. April 4, the MQM delegation went to Garhi Khuda Bux, the first time ever, we were told. April 9 was again the day's top story, for all the wrong reasons and a reaction to two top stories of the previous week. This, we were told, by no less than the president of the country. The murders, charred bodies, arson, loot, mayhem, fear and anarchy was a reaction of the beating of Dr Sher Afgan and Dr Arbab Raheem. This was the president's verdict, an outright justification. And then came April 13, the day the MQM announced to sit in opposition, again the story of the day. Almost a year since May 12, history of violence repeated itself -- on the unfortunate day of April 09 when citizens were terrorised in a similar fashion with killings of around 12 people, of whom at least five persons were brunt alive in an office building while over 50 vehicles were set on fire by the armed terrorists and arsonists. The News on Sunday: What would you say about MQM's alleged involvement in the April 9 riots in Karachi? Faisal Sabzwari: The lawyers of the MQM Legal Aid Committee were protesting over the incident of Sher Afghan Niazi which had happened the night before. The lawyers went to their respective chambers after the protest and, apparently, things returned to normalcy. But as they were coming out of the building, some miscreants caught hold of them and began to rough them up. As a result, nine of our lawyers (including a lady) were injured badly. Later, these people also took up armed weapons as well as sticks and rods, and even pelted stones. On April 9, Civil Hospital, Karachi, was witness to some harrowing scenes of blood and gore, as victims of gunshot -- badly injured and wounded -- were brought in from different trouble-hit areas of the city and packed into the hospital emergency ward. The victims of the riots, the epicentre of which was M A Jinnah Road, began to swarm the hospital, in the wake of a protest by the Muttahida Qaumi Movement Legal Aid Committee in front of the Karachi City Court. The irate group was protesting against the Sher Afghan incident that had taken place the night before when its tussle with the lawyers of KBA (Karachi Bar Association) took a violent turn and resulted in firing and stoning. The horrible memories of May 12, 2007, are still fresh in the minds of the countrymen who stayed glued to their TV screens all day long. It was a day when over 40 people lost their lives, hundreds got injured and property worth millions was destroyed in acts of violence and due to the law enforcing authorities' strange resolve to detach themselves from all that was happening in the country's largest city. The News on Sunday: Ever since their movement started in March 2007, the lawyers have been targeted and also killed. Who, in your view, are the real culprits and what could their motives be? Naeem Qureshi: The lawyers since March 9 last year have launched their movement for the independence of judiciary and the restoration of democracy in the country in a peaceful manner, without taking to streets and not a single incident of violence took place in the course of the movement. We held over 200 demonstrations outside the Chief Minister's House, Karachi Press Club, and staged sit-ins to register our protest before the concerned authorities. On April 9, too, we were having our routine general body meeting while two of our lawyers were on token hunger strike when, all of a sudden, a group of people claiming to be lawyers of MQM Legal Aid Committee thronged the office of the Karachi Bar and started hurling abuses at them besides tearing up the camp erected outside the KBA office. The transporters once again faced heavy losses during the course of the violence-ridden day of April 9 that paralysed all civic activities in Karachi. What was even more disappointing for them was the fact that this time around a couple of drivers had also got killed while several others injured. The various associations of transporters in the city had already been demanding security for their vehicles in the event of riots, but they could not alter their karma on April 9 when two bus drivers were killed, six drivers/conductors were injured and as many as 25 buses, minibuses and coaches were torched. But some dates stick in the public memory and some, very rarely, connect with each other for being strangely similar. April 9, 2008 is one such day that reminds one of another day not too long ago. The similarity with May 12, 2007 is not just about killings, it is about the killings of lawyers and passers by. And it about this all-pervasive concern that had there been a proper inquiry of the May 12 incidents, there would not have been an April 9, 2008. We've decided to ignore the larger political picture because new headlines dilute the impact of the tragedy. We've decided to keep the breakdown in the PPP-MQM parleys aside. We have also not discussed the 'PPP's non-seriousness in talks with MQM', its lack of hospitality with MQM in Naudero, the controversial appointment of Shoaib Suddle as the police chief or MQM Haqiqi's resurfacing on the political scene. We've decided to focus on April 9 instead and relive it. We do understand that PPP needs to reengage with MQM but we do not understand why must this be done under coercion or political blackmail. Besides we think that no political context can justify what happened in Karachi on April 9. We have revisited May 12 because we thought it was necessary. We do all this so that journalism proceeds on its course without references like May 12 and April 9. The trouble started when a group of lawyers, backed by the Muttahida Qaumi Movement (MQM), held a demonstration at the courts to protest the manhandling of Dr Sher Afghan Niazi, who was attacked by lawyers in Lahore a day before April 09. MQM alleged that the members of its legal aid committee, who were protesting against the manhandling of Dr Sher Afghan Niazi, were attacked by members of the Karachi Bar Association. Interestingly, the Karachi Bar rebutted the claim, saying they were attacked by their rivals who had barged into the KBA office. As soon as the clashes broke out, hundreds of armed men collected near the city courts and started setting vehicles, bikes and public transport on fire. At some places, the police fired shots into the air to scare away the 'miscreants', but no one moved and eventually the police, too, fled from the scene as violence intensified. But the most horrific incident was the burning of Tahir Plaza, an office building used by the lawyers where the arsonists burnt alive a lawyer named Altaf Abbasi and four of his clients, two of which were women. According to eyewitnesses, miscreants led by a notorious criminal (dubbed as 'Waseem Hold') locked the main gate of Tahir Plaza, situated opposite the courts, opened indiscriminate fire at the building and later set it ablaze. Some people who were present near Tahir Plaza revealed that the police personnel from Risala Police Station, who were present at the scene, called at the fire station repeatedly but the firemen refused to come. Even after a police mobile was sent to ensure them security, the firemen still did not arrive citing security reasons but lawyers believe the city fire brigade department is full of sympathisers of the 'terrorists' and firemen were ordered by them not to leave their stations until authorised. On the other hand, having no ladder or help from the fire brigade, the policemen climbed the building adjacent to Tahir Plaza, broke its wall to make way for the burning building and vacated the trapped lawyers and other people inside. Fire tenders reached the spot two hours after they were called and started efforts to extinguish the fire. After the flames were doused, the rescue staff entered the building and found five completely charred bodies, including two bodies of women, lying in the burnt building. Earlier, it was thought that the charred bodies were of lawyers whose offices were situated inside the building but at least one of the bodies was identified as that of Makhdoom Altaf Abbasi, Advocate. Later, it was revealed that other deceased were clients of Altaf Abbasi, Advocate, who were not fortunate enough to escape like other lawyers and common people present in the ill-fated building when it was set alight. The same day, at around 3.30 pm, miles away from the City courts, another building which was the office of Malir Bar was attacked by the terrorists and set ablaze. A lawyer who was inside the building said he was sitting in his office at the Malir Bar building when he heard gunshots and voices of his colleagues who were fleeing the premises from the back door. "I saw at least 20 persons, who were on motorbikes with bottles and guns in their hands. They threw the bottles at the building and inside open offices and within a few minutes, the entire building was in flames," he recalled. Fortunately, no lawyer was trapped in the building, or injured in the firing episode as all of them successfully managed to flee the spot soon after the attack. At the same time, armed terrorists riding on motorbikes emerged on roads in old city areas like M A Jinnah road and Burns road and opened indiscriminate firing on pedestrians as well as motorists and starting torching public and private vehicles. A minibus driver was shot dead on M A Jinnah road after all the commuters were disembarked and the vehicle was set on fire after throwing petrol on it. It is learnt that the driver of the bus had requested to spare him but one of the terrorists replied, "Your time is over!" and riddled him with bullets. Three cars parked outside the S M Law College near Burns road were also set ablaze by the terrorists while the driver at a private hospital was shot dead after he tried to resist and escape the arsonists. 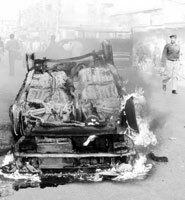 At the end of the day, it was learnt that over 50 vehicles including private cars, minibuses, motorbikes and rickshaws had been torched by terrorists in different areas of the city including M A Jinnah road, Burns Road, Nagan Chowrangi, Liaquatabad, Gulistan-e-Jauhar, Malir and Landhi while the number of victims swelled to 12 including those who were burnt alive at Tahir Plaza. Traffic jams were witnessed on most of the busy arteries and roads of the city at the onset of violence after the people started leaving their offices and reached for their homes as armed terrorists resorted to heavy aerial and in some cases direct firing on common people in the streets. The role of the law enforcing agencies including that of police and Rangers on April 09 remained questionable as there were hundreds of armed terrorists on the city roads with automatic and semi-automatic weapons and petrol bombs in their hands, but neither was identified nor any of them was arrested by the law enforcers. "I was present at Liaquatabad where a minibus was stopped by the terrorists who asked people to leave the vehicle. Later, they sprinkled it with petrol and set it on fire. A police mobile was present a few yards away from the scene but they fled instead of challenging the terrorists," said a woman who had witnessed the burning of the bus. This was clearly an act of violence. Those who were involved in this episode of 'terrorism' have also been involved in many other scenes of law-and-order disruption in Karachi besides operating as mafias at different levels. Usually, an act of violence is limited to a certain area or extends to the city. But when we saw that this scenario had induced a serious national reaction, we received orders from our leader Altaf Hussain, who was furious at us and told our senior leaders and MNAs to reach the spots of trouble immediately. This is the one reason why the law and order situation was brought under control fast, otherwise similar incidents could have occurred in other areas, too. TNS: Why did the MQM suddenly make the decision to sit on the opposition benches when negotiations with the PPP were still underway? Was there a disagreement over the share of cabinet ministries in the Sindh government? FS: MQM has joined the opposition for a variety of reasons. It is not that we don't want reconciliation. In fact, it's our first priority to have negotiations and peaceful relations with not only the PPP, but the other parties, too. The problem is, when you sit across the table and talk about government formation and share in the cabinet, you have to come up with something concrete and positive. Unfortunately, the PPP did not talk about anything substantial. They were just buying time. When confidence building measures are being taken, it is important for both parties to be able to trust each other. Take the Shoaib Suddle case, for instance. The PPP has appointed a man as controversial as the IG Sindh and this was an action that even the MQM was surprised at. It was a completely arbitrary decision and was taken without any consultation with the other party. It is not only Suddle; there are many other officers whose conduct is questionable but they have been given important designations. Suddle himself was DIG Operations in Karachi along with other officers who were working at the time of the operation against MQM in the 1990s. Regarding this, at least, I believe the reaction shown by the MQM was a very predictable one. No one would be content over this. At the same time, in spite of all that happened, we still want to have talks. We want negotiations and reconciliation. TNS: Now that you are in the opposition, people fear that there will be a law-and-order situation in the city and there will be strikes.. Comment. FS: I seriously hope that there is no reason for strikes in Karachi or, for that matter, anywhere in Sindh. When MQM was in governance, we took care of this city -- the city that we love, the city that we own -- and we had the law-and-order well under control. We did everything we could for the people. Foreign investment was coming in, the credit of which goes to MQM. The City District Government Karachi (CDGK) worked hard to make the city beautiful and peaceful. The Sindh Government, too, worked well to give the people what they needed. Now that we have earned peace for the city, we don't want it to be disrupted at any cost. Why would we want to create havoc and disrupt the law and order system of Karachi? We are the representatives of Karachi, not its destroyers. TNS: What do you have to say about Haqiqi being allowed to resume its political activities? FS: First of all, the news which recently floated around about the Mohajir Qaumi Movement-Haqiqi (MQM-H) being allowed to resume its political activities is a farce. No such thing is going to happen. Secondly, the Haqiqi group cannot be accepted as a political party. It is more of a mercenary mafia and a gang which operates in certain areas. Muttahida is a party of the masses. There is simply no comparison. TNS: In a recent meet-the-press session at Karachi PC, Dr Farooq Sattar announced that some 2500 criminal elements had been eliminated from the party. Could you tell us about the impact this has had on the party and if there are more of such elements left? FS: MQM is a party which is above board and open for accountability at all levels. We got rid of all the harmful elements from our party and, as Dr Farooq Sattar stated, over 2500 have been shown the door already. The process does not stop here. MQM is also a representative party of the people, especially those belonging to the lower strata of society. This is the main reason why the common man is all praise for us and we won so many seats in the Feb-18 elections. Purging the party of criminal and corrupt elements has made us even more transparent for the people. At the same time, I would like to ask why fingers are pointed only at the MQM? Are all the other parties so perfect that they need not be held responsible for any such incident? Are they without any criminal elements? TNS: How did such elements creep into your party, in the first place? FS: Honestly speaking, there are always people with bad records who may enter a party and try to influence others to join them in their nefarious activities. Thankfully, we have driven such people out of our circle. However, like I said before, the process does not stop here. When a new person joins the party, we have his background checked and, if not immediately then in a matter of a few months only, we come to know who that person really is. If he has a dubious background, we take action which is regardless of designation or seniority level in the party. Inside the Hospital, the first victim that was brought in was Police Constable Mohammad Khalid who claimed to have been shot in his right leg as he was trying to stop two groups from firing at each other. Bleeding profusely, PC Khalid told TNS that he had been brought to the hospital by his friend who was also present at the scene. "I was trying to stop the violence at Burns Road when I received two bullets in my leg," he said. In all, at least 18 injured people were brought into the Hospital, apart from two others who could not sustain injuries in the head and expired immediately. Perhaps the most devastating is the case of a woman who -- along with her young son -- became a victim of stray bullets. Rakhshanda, 45, and her son -- Thamin, 7 -- were standing at the balcony of their house in Ranchore Lane when they were hit by bullets -- apparently fired up in the air from the street down below. A bullet pierced through Rakhshanda's wrist while another grazed her chin as she lunged forward to duck her son. Unfortunately, she could not save Thamin from receiving a bullet in the back of his head that cut deep. The CHK doctors asked Rakhshanda's family to take the boy to another hospital for intensive care and surgery. The child was eventually taken to the Jinnah Postgraduate Medical Centre (JPMC) where he was kept in the ICU for two days before he lost his life. In addition, the Medico Legal Officer (MLO) who was present in the hospital at the time of the incident, Dr Farhan spoke of the doctors receiving two bodies of people who had died on the spot. Both were drivers and had received gun shots in the head. One of them was so badly riddled with bullets that his brains had spilled out of his skull. The other was still breathing as they brought him in, but the doctors failed to resuscitate him. The scene at the hospital was not only shockingly gruesome, it also served to evoke the fears of the people of Karachi, as they witnessed one casualty after another in their vicinity. "Karachi has gone mad again," said an angst-ridden old woman who had watched the ambulances drive by and stretchers carrying bleeding victims pack off to the hospital. Not even a year has passed since these tragic events occurred and a repeat of them -- to a great extent -- was witnessed on April 9, 2008. This time, again, people were killed, vehicles burnt and private and public property destroyed by miscreants to achieve their desired results. The very first reactions to these latest incidents of violence were those coming from the people who had called for proper fixing of responsibility for May 12 incidents. Their point was that had the perpetrators of violence on that day been identified and given exemplary punishment no one would have dared to repeat the acts again. Regardless of who was responsible for the whole mess there are no two opinions that the day will be recalled as the one 'when the state withdrew' and an entire city of nearly 15 million was held hostage by people who appeared to be private citizens. The fact has been highlighted in a report titled 'A City Under Siege: Carnage in Karachi', issued by Human Rights Commission of Pakistan (HRCP) The report says: "It appears almost incomprehensible that large-scale violence of various types of roadblocks, ambushes, armed clashes, abductions etc was meticulously planned and executed across the city, while the state security apparatus was effectively withdrawn." HRCP says its 124-page report was based on research, newspaper reports and interviews of the people about the acts of omission and commission pertaining to the events of May 12. The commission asserts there has been a consensus on the point that the massacre was pre-planned and was not possible without the government patronage. HRCP officials categorically hold Muttahida Qaumi Movement (MQM) responsible for the violence perpetrated on May 12 -- an allegation denied vehemently by the latter. Those holding MQM responsible for violence claim that the party's chief Altaf Hussain had addressed party workers from London on May 8, 2007, and warned of clashes among different groups. He said, "If conspiracies are hatched to end the present democratically elected government then each and every worker of MQM will stand firm and defend the democratic government." Besides, his announcement regarding holding of an MQM rally on the day when the deposed CJ Iftikhar Muhammad Chaudhry was to arrive in Karachi was also a step criticised by many. For example, PML-N Secretary General Iqbal Zafar Jhagra had urged the MQM to change its May 12 rally plan in order to avoid any untoward situation. What followed is everyone's knowledge. In this backdrop, one can recall how the CJ was confined at the Jinnah International Airport for hours on May 12, hundreds of opposition activists arrested before CJ's arrival, around 15 members of Awami National Party (ANP) and 14 supporters of Pakistan People's Party (PPP) were killed by armed hooligans, bridges, flyovers and rooftops of flats, containers, and vehicles parked alongside Shahra e Faisal were all used to take positions by armed miscreants, the driver of an Edhi ambulance was shot dead and the media people and the office of Aaj TV were attacked. The building of Aaj TV was fired upon for more than five hours and the vehicles parked in its parking area were torched apparently in a bid to punish the channelwallahs for showing incidents of violence live. The staff appealed to the law-enforcement agencies and was only responded to after five hours with two mobile police units. The worst part of the story is that the police and rangers were nowhere in the picture. Newspaper reports have suggested that the police personnel were asked not to carry any kind of weapon during the law and order duty with the rally. It was also observed that on the night of May 11 and, later, 12, the city courts -- Malir District Court and High Court -- were under the control of the people who were neither in police uniform nor moved in official vehicles. Chairman Pakistan Tehreek-e-Insaf (PTI) Imran Khan was also among those who had directly held MQM responsible for the massacre and condemned British government for giving citizenship to MQM chief Altaf Hussain. "We will hire a lawyers' panel in London to file a suit against [him] because he is responsible for the killing of innocent people in Karachi," he alleged. Imran wanted to visit Karachi after making this statement but he was stopped by the Sindh government from visiting the city for a month. It was feared that his visit at that time could adversely affect the law and order in the city. Former federal law secretary and HRCP co-chairperson Iqbal Haider tells TNS that the HRCP report is based on first-hand accounts and interviews with affectees and witnesses of May 12 incidents. The allegation that the commission's report is fabricated is baseless, he adds. He also says that the whole country knows how President Musharraf and his ally Altaf Hussain gave threatening challenges to the lawyers and all those supporting lawyers' movement. "Musharraf even raised his fist in the air during a public rally in Islamabad that very day and said that people had shown their force in Karachi." Iqbal says that MQM announced a rally the same day to show its strength and stop the CJ from addressing the city bar. "There was no police or rangers on the streets and the party had full support and protection from the government, headed by a governor from their ranks," he adds. Meanwhile, MQM has rejected the allegations leveled against it and alleged that the HRCP chairperson Asma Jehangir has been playing politics under the banner of human rights. In a press conference after the release of the HRCP report, MQM deputy convener and parliamentary leader Farooq Sattar had said that the case on the May 12 incidents is pending in the courts. MQM has collected lots of evidence in its favour and will produce it in the court, he said, adding that presenting such a report by the HRCP was tantamount to contempt of court. What they called MQM Legal Aid lawyers were actually the employees of City District Government, Karachi, and their office was -- fortunately or unfortunately -- situated at the back of the City Courts. They showed up in the form of a group at KBA and phoned the nearby unit incharge who reached the venue within seconds, armed with TT pistols and other ammunitions and chemicals and started beating the lawyers and threw chemicals upon them. They besieged the entire area and torched vehicles parked in the area, creating harassment and then left for Tahir Plaza -- the building that has lawyers' offices -- locked them in and burnt them alive. TNS: Did you file an FIR? NQ: The KBA filed an FIR against MQM stating that the mob, armed with ammunition, had set on fire Tahir Plaza that killed seven people including one lawyer Altaf Abbasi. Idrees Bangash, SHO, Risala Police Station, refused to register an FIR against MQM. The KBA sent a written complaint to the concerned authorities about the attitude of Risala SHO, whereupon the latter was immediately removed from his office. This was the first positive step that the new government took which showed their sincerity and dedication towards the lawyers' movement. TNS: Do you think that justice would be provided to the lawyers in the present set-up? NQ: We have demanded that an independent inquiry tribunal should be set up which would investigate the April 9 incident and award punishment to those involved in the massacre. TNS: Will you demand a reopening of the May 12 cases? NQ: Of course, the FIR registered by the KBA against MQM is still there. It is said that former chief minister Arbab Rahim used his powers and influenced courts so that the matter could be stayed. But we are hopeful that the new government will, as per its promises, re-open the case and grab hold of the real culprits. TNS: If the new PPP government manages reconciliation with the MQM, do you still see that happen? NQ: Well, the government has got to achieve this. It is the responsibility of the elected government to solve its people's problems, otherwise it should be prepared to meet the same fate as the previous government. TNS: How many lawyers sacrificed their lives during the course of their movement? NQ: Five lawyers were killed over the last one year, at the hands of the terrorists, and we still await justice. Raja Riaz, an advocate of Karachi, was killed while he was on his way back home, close to the Sindh Assembly building which is a VVIP area. Then, Pervez Akhter Kiani was gunned down by MQM's terrorists. Ateeq Qadri was also the victim of the same group. Although FIRs were lodged but they did not nominate any MQM person. Altaf Abbasi was burnt alive on April 9 and Shehryar Sherry was targeted the same day. TNS: Was any of the lawyers belonging to MQM Legal Aid Committee killed? NQ: Contrary to the claims made by MQM, no common man who was killed in the riots belonged to MQM. I would like to appeal to the party to stop playing dirty politics. TNS: Could you give us details of the losses of property in the April 9 incident? NQ: As many as 40 offices of lawyers were damaged by the MQM workers who also set on fire the lawyers' offices in Clifton, Gulistan-e-Jauhar, Tariq road and other areas of the city. It was all pre-planned. Then, the houses of the lawyers were set ablaze. It was an act of victimisation, meant to pressurise the legal representatives. But they should understand that we will not surrender before guns; rather all these incidents have strengthened our struggle and given further us impetus to fight the evil forces. Mark my words, if, in future, any lawyer is attacked, the legal community will stand up for him and will not be afraid to sacrifice their lives. TNS: What are your plans for May 12? NQ: We plan to observe Black Day on May 12. All bars of the country will boycott court proceedings, black flags will be hoisted on the rooftops of the court buildings, and a protest procession will be taken out. TNS: It is expected that the judges will be restored by April 30. How will you go ahead with your plan to observe the Black Day? NQ: See, Black Day will be observed to commemorate those who were killed on the day when the city was plunged into darkness. The transport community claims that they are victimised basically because of the fact that a majority of them happen to be Pakhtoons, Punjabis and non Urdu-speaking. They also blame a particular political party for being hostile to them in terms of providing them the desired protection. The incidents of May 12, December 27 and April 9 prove that administration failed to protect these public service vehicles from arson. The transporters now have serious concerns over the failure of administration to control law and order situation in the city that causes heavy losses to the bus owners and people associated with this business. The killing of their drivers, claim transporters, was also a conspiracy against their community with objectives to incite ethnic violence in the city. The transporters role in city's activities is very crucial since successive governments including the one backed by General Musharraf failed to provide a government owned public transport. Owing to this, the citizens have been left with no other option but the existing transport. The small size minibuses and coaches are not able to cater to transportation needs of this mega polis while UTS buses that earned a good reputation and conveniently served a large number of people initially also became nearly non-functional. Therefore, whenever transporters are victimized due to violence they call strikes which indeed cause a great deal of inconvenience for general public. Transporters are very well aware of the fact that government is compelled to fulfil their demand since the city is deprived of government owned public transport. Although in existing transport setup of Karachi, transporters are called 'the mafia' but the citizens who have been sick of the same mafia are compelled to use the same since they have to commute anyway. On April 9, public transport disappeared from all major and minor thoroughfares of the city within minutes. While those stuck up in traffic jams, if not torched, were highly over loaded with stranded passengers who knew they would not find transport later the same day. Hundreds of passengers who were stranded due to shortage or unavailability of public transport thronged to City Railway Station to catch the local trains that left with scores of passengers who hardly found a bit to place their steps on footboard. Transporters may be right to have security concerns during trouble days since they have not been compensated for several vehicles torched and damaged in different incidents of violence. But later on, knowing the fact that both general public and government, depend on them, they demand for compensations as well as other things such as increasing bus fares in response to increase in oil price. Similarly, they are also able to do away with several notices in regard to the fitness of their vehicles and converting them to CNG etc. Once again they have demanded from Sindh Transport Minister for the compensation otherwise they would call for a strike of indefinite period. And certainly, the government has to listen to them and consider their demands since they have no other option. While it is also obvious that the continuous failure of administration to provide them with protection during trouble days can lead to serious transport problems in the city.